Knowing How Hard The Wind Is Blowing? There's An App For That… Well, And A Piece Of Hardware Too | OhGizmo! Haven’t You Always Wanted A $1,200 Throw Pillow Made From Old Shoes? By David Ponce on 06/19/12 • Leave a comment! There are situations where knowing just how fast that breeze is going can be important. We think. Like when you’re playing golf, or surfing, or… Well you get the idea. 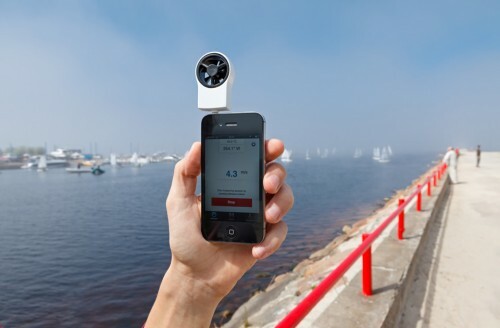 Instead of relying on a website which may give you a general idea of the wind speeds over a large area, the Shaka Wind Meter for the iPhone can let you know on the spot. It’s a little fan (some may call it an anemometer…) that plugs into your headphone jack and interacts with an application. You’ll get to know about wind speed and direction, as well as being able to post your results to Facebook (why would your friends care?) and overlaying the data on a map for… well, we’re not sure why this is cool. But we feel that the failure is on our part and not on Shaka; it’s entirely possible that there’s a wind-speed dependant world out there (Hey, sailing! What about sailing?) where this product would be right at home. ← Haven’t You Always Wanted A $1,200 Throw Pillow Made From Old Shoes?